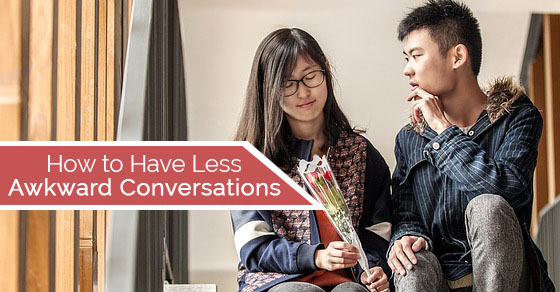 How to Avoid or Have Less Awkward Conversations? How to Avoid Awkward Conversations? Researchers have stated that it takes just about four seconds of absolute silence to boost your anxiety in the middle of a conversation. In short, the more you feel like you’re anxious, the lesser chances you will have of becoming articulate. Whenever you can, just play things that you would like to say in advance. You should know what you have to communicate towards others and that will help you deliver the right message in ways that will stop an awkward silence as much as it is possible. It is always a great idea to speak in a private setting. You should never hold a conversation that is impromptu inside the hallway when you actually happen to be passing by that particular person. Instead of that, you should meet them in a private room where there is no one else who can hear. And in case someone else happens to bring a conversation or a subject that is awkward inside a public setting, you should suggest having that conversation somewhere else. Standing while talking can actually make conversations quite boring. And what you can really do with the other person really matters at this point. Since you are hoping to make some good conversation with them, then make sure to sit down. You will be physically talking to them and you have to see which tone you would like to set. If there has to be a single chair inside the room, you have to remain standing with another person. But sitting down according to us is a smart way to go about it. You can soften words that are harsh or question directly by using a very simple warning. Instead of just saying that Billy says that apparently you smell bad, you should actually say something simpler. That will give the other person a minute so that they can emotionally prepare to what they are about to tell you. Plus soft warnings are so much better than telling people off directly. You should keep your words as simple as possible and that will surely make a difference. Instead of denying the fact that you are uncomfortable, it could actually lead you to come across as someone who is disingenuous. If you happen to be fidgeting, constantly shifting your weight or even if you are averting an eye contact, you should be able to acknowledge the fact that you are anxious. You should also offer a sentence that is quick and which will explain what someone else has already sensed in. You may also say that you are not very comfortable speaking about this right now. Acknowledging is always a good thing. You also tend to make a better impression of yourself in that way. Even though it is extremely important to speak politely during a conversation, you don’t have to speak so softly that the important part of your message is lost. If you have been firing someone because of their incompetence, then you don’t have to imply that they are going to be set free because the work is just not enough. Making indirect conversation will always add to the confusion of the person about what is really happening at this point. So stick to these facts and make sure the conversation is short. It is very important to be a good listener while speaking to someone. You should give the other person another chance so that they can process what you have just told them. Remember to be a listener who is active and always reflect back on what you hear and offer them a clarification on some points that they probably have misunderstood. You should be prepared for someone else to experience those emotions which are intense. They range from fear to anger and sadness and embarrassment. Unless of course the person starts to make conversation that is inappropriate. When a conversation is awkward, it tends to end in a manner that is awkward. Uncertainty about if the conversation is really over or even if it is about confusion and what is going to happen next, this will only keep adding to the feeling of clumsiness. If you happen to follow up with something, you should always mention that. In case you expect another person to take no further action, you should always express this expectation. Towards the end, you should end the conversation on something like that is all that you wanted to speak about today and that you want the person to think about it and get back to you in case there are questions. Obviously this point is way easier said than done but the more you care about what others have to tell you, the less happier and more socially awkward you will be. Even if it means that you’ll have to grab a few drinks in order to loosen up, you will do everything you possibly can in order to be a little stress free. What others think is none of your business. Plus being too self conscious is never a good thing. In that way you will be straining yourself and in fact the conversations will begin to get even more awkward. You have to keep things as authentic as you can even though there is one thing you can do. Keep reading to find out! You should smile and smile as much as you can. You should follow things up with a little more friendly and cordial conversation. Try to be as friendly and as fun as you can. You should look like someone who is happy and entertaining. This is actually what makes Rachel Ray and Ellen so appealing and lovely. But always remember that you can never imitate someone else. That would be a wrong thing. Pretending is a horrible idea and it has made many people sad and unhappy. It will do the same to you. So be careful! When you feel like something rude or uncomfortable is being said to you, whether it is another person or someone you know… there are chances that the conversation may stop right there and make the whole situation awkward. When people are not laughing or have no response to something that is very much offensive! You don’t have to try to fill up that void. By doing this, you will actually end up becoming uncomfortable. Now there are truly some places where silence can be great thing, only if it is another person who is responsible for this kind of quietness. But in case you have started this anxiousness, then wait for a couple of seconds for a new topic to come up. It is actually a much easier thing to say something straight forward and bold to a person on Whatsapp than it is in person. Our generation is so dependent on technology that we hardly care about meeting the person. Maybe you are not very comfortable about functioning in public with them or even making a conversation that is not kept behind the keyboard. The only way you may get used to a social environment like this is repetition. The more you speak to these people, the easier things will get. Like someone who is occasionally anxious, we can assure you that it can definitely be done if you are a confident person. In order to break the awkward feeling, you have to show some sign of physical interaction with the ones you meet. You should shake hands, give them a hug, smile when you greet them. That will show that you are quite interested in speaking to them and in making conversation. That will also kill the awkward feeling and you will actually start to feel better. If you think hugging and shaking hands is too much for you, then do them at all. You should show no signs of physical interaction if you think you can handle it. Keeping your phone by your side is actually a pretty cool thing to do. In case you are in a conversation where you are not feeling invited, you can always shift from there by pretending like you have something important to do on your phone. In that way your phone can actually rescue you from an awkward situations! There are so many times when we get into tough situations in life but that of course can be solved if you just keep your phone next to you. Keep something fun and interesting in it so that there will be something you can play with when no one else is near. Don’t you ever turn up late for an event! It would actually be too bad for your reputation. In fact if you can, you should show up as early as possible so that you don’t have to miss a single event. Showing up early during events is actually a pretty cool thing! People will begin to think you are interesting person and they will also want to speak to you a lot more. Plus when you show up early you will have time to prepare yourself a little in order to make better conversation. Now this is something you should always remember. No matter where you go and what you are doing, there is no need to stress and worry about screwing up. People make mistakes and that is normal. You should always come across as a person who is fearless and confident. For that, you need to stop worrying so much about what you are saying. While speaking, you should always remember to use the name of the person. In that way, the conversation becomes much better and easy. So When you are speaking to someone, ask them about what they are doing, their name and stuff like that. In that way you will get to learn so much about them. In any language according to experts, knowing the name of the person and saying it is the best thing that you can possibly do. We understand that making conversation is hard. But of course that does not mean that things have come to an end. If you follow all of these tips and ideas, you will surely find some help. There are hundreds of people like you out there who need help just like you do, so don’t forget to share it with them. Apart from that, you should also give us some of your feedback in the comment box below. We would love to hear from more from you. On that note, good luck and here’s hoping you will make conversations more interesting from now on!